It is a wet and dreary Sunday morning. Cool rain trickling down, birds chirping, green everywhere. The May long weekend – a bank holiday, as the English would say. And I find myself in a very unusual position, reading European literature. 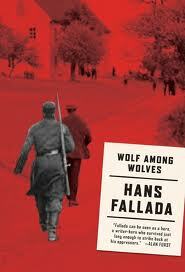 For some reason, at the library the other day, I’d been desperate enough for good reading material, having exhausted their supply of intelligent science fiction, that I’d picked up “Wolf Among Wolves” by Hans Fallada. It was an English translation, of course. My newfound European awareness does not extend to actually speaking any of the continental languages. I’m Canadian, for God’s sake. Western Canadian to boot. I doubt there’s another group in the world as content with the English language. Hmm. Not something you see every day. Art presented in the face of possible annihilation by the authorities has, in my view, a certain gravitas the should be respected. And so I took it home, this “Wolf Among Wolves.” And what a fascinating book it is. If you want to understand how the German people could thrust Hitler to the top, this is the first and only book that shows the answer. Berlin of the 1920’s: cocaine, starvation, and stunning inflation. Each dollar worth half this week what it was last. Buy now. Buy anything, before your life’s savings aren’t worth a loaf of bread! An insane time of depression, of grief at the loss of millions, of hopelessness and confusion. Heavy stuff, captured quite brilliantly in this novel. So, for relief, over breakfast, I started on another book: “The Bradshaw Variations” by Michel Cusk. Which, it turns out, is an English book about a family. A story describing life in the way that only English authors do – all about the thin façade of reality, the languid, liquid search for identity, for meaning. The angst of mid-life. Oi, vay. It’s all too much. Add in the weather, and I’m in one of those places captured so well in both books – disconnected, drifting, uncertain. Life, for the morning, feeling like a train that’s rumbling by – and I am stranded on the platform, wondering at the certainty of its destination. This place, though, never feels quite real to me. It is, almost invariably, a result of art, usually literature. No wonder I avoid literature like the plague. Lesson learned. Time to get on with my day. Time to DO…something.